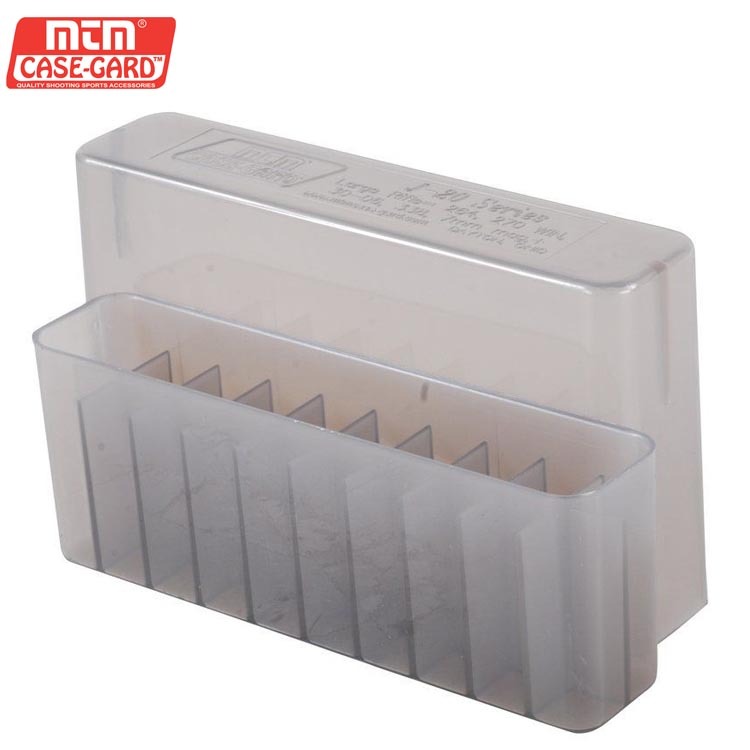 MTM CASE-GARD J-20 series ammunition cases are a favourite of rifle enthusiasts throughout the world. Made of virtually indestructible polypropylene that will not warp, crack, chip, peel, expand or contract. 220 Swift, 224 Clark, 225 / 25-284 / 270 / 284 / 307 / 308 / 356 Win., 240 Wby. Mag., 25-06 / 244 / 280 / 6mm / 7mm-08mm Rem., 257 Roberts, 30-06 Spr., 30-30 Win., 30-40 Krag., 308 Marlin Exp., 360 Nitro Express 2 1/4”, 375 Rimless 2 1/4”, 32 Win. Spl., 338 Fed., 35 Whelen, 376 Steyr, 38-55 Win., 444 Marlin, 400-375 Belterd Nitro Exp., 6.5 Carcano, 6.5 Creedmoor, 6.5×257 Roberts, 6.5-284 Lapua, 6.5×50 Jap. Arisaka, 6.5×52 Italian, 6.5x54mm Mann-Schoen, 6.5x55mm Swedish, 6.5-06 A-Square, 6.5-284 Norma, 6mm-284 Win., 7×57 / 7.65×53 / 9.3x57mm / 10.75×68 Mauser, 7×64 Brenneke, 7.5×55 Swiss, 7.7×58 Jap., 7-30 Waters, 7.35 Carcano, 7.5 Schmidt Rubin Swiss, 7.5×54 French MAS, 7.5×55 Swiss, 7.7×58 Jap., 7-30 Waters, 8x57J, 8mm-06, 9.3×74, 9.3×62, 9.5×57.